In the UK we are known as a nation of animal lovers. Many people have at least one animal, whether it is a fish or a horse, with most choosing a dog or cat as their domestic companion. According to research by The Press Association, it would seem that be can’t bear to be without our fury friends, as two in five people now apparently take their pets on holiday with them. For those who do not take their pet along for the ride, the recent survey also found that as many as 47% said that they miss their pets more than their family when they go away. 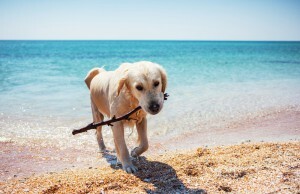 Furthermore, many said they would rather holiday with their pets than with family! 40% of those surveyed must have huge phone bills, as they admitted regularly checking up on their animals while they were away, because 36% said that their pets welfare was their biggest worry while on holiday. To add to this, half of the animal loving participants surveyed, admitted that they pay their pet special attention when they return home, with 18% returning with a gift for their pampered pet.
. Make sure you do plenty of research before you make this decision. Rules on pet travel will vary depending on the country you are visiting, and so will fines and punishments if they are put in quarantine for any reason.
. Like human travellers, your animal will require a pet passport, which you can obtain from your vet. Make sure you order this a few weeks before your trip, to give it plenty of time to arrive.
. Before travelling abroad always take your pet to the vet 21 days beforehand, to ensure they are microchipped, have had a rabbies shot, and worming for dogs. Your vet should be able to give you advice on all the necessary vaccinations etc. Where ever, and whoever you decide to holiday with this year, just remember to protect yourself against holiday mishaps, by investing in top quality travel insurance. At Holidaysafe.co.uk we offer award winning travel insurance for any holiday and any budget. Our Single Trip Travel Insurance includes; Cancellation, medical emergencies, personal belongings, cash and travel documents and much more. We also offer multiple levels of cover allowing you to choose the best policy for your needs.